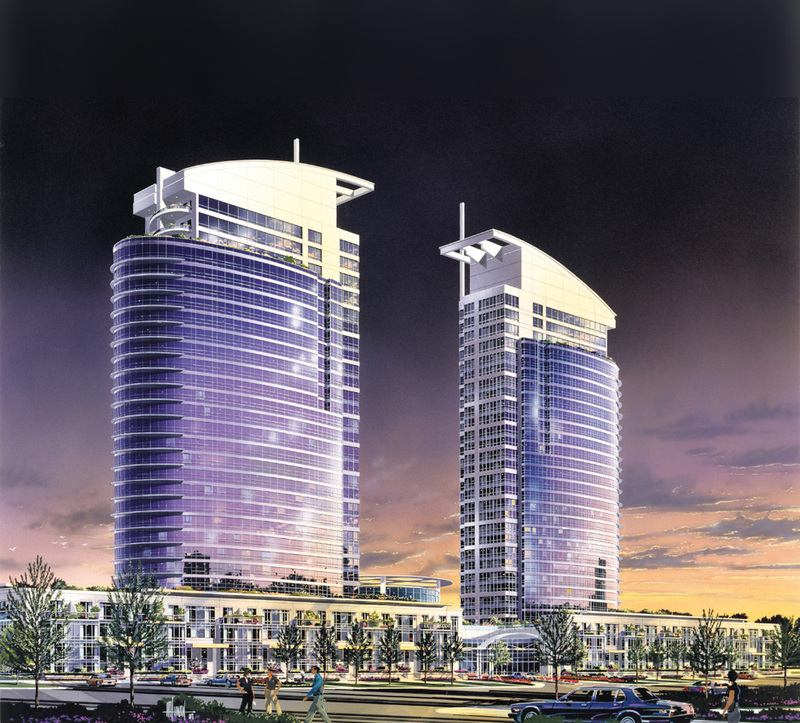 These two, thirty-six storeys residential, condominium towers, rising above a five level podium, located in the Scarborough district of Toronto, at the south side of highway 401, were completed in 2004. The entire complex is built above two levels of subgrade parking, with four additional parking levels above, to the east and west of the central amenities block. The interior walls and columns are founded on spread footings which bear on natural undisturbed soil capable of safely sustaining pressures of 400 to 750 kilopascals, (ie. 8,352 to 15,660 pounds or 4.2 to 7.8 tons per square foot). The P1 level, the major portion of the ground floor level, the second and third floor levels are primarily 220 mm thick, reinforced concrete, flat slabs, with 150 mm deep drop panels, over the columns. At the east and west ends, and at the south side of the podium, from the ground level to the fourth floor, there are two level townhouses framed with one-way, reinforced concrete, slabs, which are 230 mm thick, spanning 7 metres between reinforced concrete shear walls. The east and west towers are similar, from the fifth floor up to the thirty-fourth floor. The floor framing, in general, takes the form of 200 mm thick, one-way reinforced, concrete, slabs spanning as much as 6.7 metres, between reinforced concrete shear walls. At the thirty-fifth floors, the slabs are also one-way, reinforced, concrete, but the thicknesses are increased to 300 mm to support the mechanical penthouses loads. The specified twenty-eight days strength, for the concrete slabs in the parking levels is 35 megapascals, with seven percent, plus or minus, one percent of entrained air. At the fifth floor, the concrete is specified to have a strength of 32 megapascals, at twenty-eight days. The 32 megapascals, at twenty-eight days, also applies to the floor slabs from the sixth thorough to the tenth floor. From the tenth to the eighteenth floors, the concrete in the slabs was specified to have a strength, at twenty-eight days, of 30 megapascals, and was reduced from the nineteenth to the thirty-fourth floors to 25 megapascals. Both towers, have a, three elevator, reinforced concrete, shaft, and two emergency stairwells with reinforced concrete walls, extending from the foundations through to the thirty-fifth floors. The reinforced concrete walls, of these elements interact with the shear walls to resist lateral forces, and displacements, resulting from wind or seismic affects.